Michael Smith came to Scotland for multiple challenges. He joined Hearts on a two-year contract in June to fill Callum Paterson’s No.2 shirt. Added to that, he wanted competitive football and craved an international recall with Northern Ireland. So far, he is succeeding on all fronts. The right-back ignored sniping from some quarters in England when he swapped Peterborough United for Tynecastle. He was eager to see how the Ladbrokes Premiership compared with League One and has been pleasantly surprised. 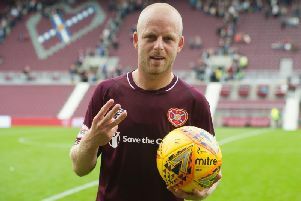 His consistent performances for Hearts have earned him fans’ respect as Paterson’s replacement. Stepping into the Scotland defender’s position might have daunted others but Smith was confident of taking on that mantle. A call-up by Northern Ireland manager Michael O’Neill last month fully justified his decision to move north of the Border. Choosing Hearts as his next destination is already proving a sound career move. “Without a doubt, being at Hearts has helped,” said the 29-year-old, speaking exclusively to the Evening News. “Michael O’Neill lives in Edinburgh and he gets to a few games. Hopefully that will continue and I can keep my form up. Smith targeted more international recognition because he is determined not to remain a one-cap wonder. His only Northern Ireland appearance to date came in March 2016 in a friendly against Slovenia. “I definitely want more caps but, if that doesn’t happen, I’m happy to be in and around the squad,” he added. Excelling in Scotland in the very city O’Neill inhabits can only enhance his chances. “There’s a wide range of standards in this league We beat Hamilton 2-1 on Saturday but I thought Hamilton were the better team on the day. We battled hard and won the game. “It has surprised me a little bit up here because people were putting the league down, saying: ‘It’s not great.’ I was up for the challenge. I wanted to come and see what it was like. At club level, it’s all about building momentum now. Craig Levein’s return as manager offers Hearts the kind of stability lacking in recent months. Smith missed Levein’s first game in charge against Aberdeen at Murrayfield due to illness but his colleagues put in an impressive display. The 0-0 scoreline left them rather frustrated, which they atoned for on Saturday at Hamilton. The theme of the 2-1 win was Hearts’ defensive resolve and fighting spirit. Smith more than played his part at the back but also claimed a cheeky assist by supplying the cross for Ross Callachan’s opening goal. “I wasn’t expecting to be in the team but Connor picked up a little niggling injury last Thursday. I played and I’m happy,” he smiled. “I got forward and got an assist so I’m just pleased for the team and pleased for everybody. Those battling qualities will be critical to Hearts’ hopes of progressing up the Premiership table. The visit to Lanarkshire was the first in another run of four away matches whilst Tynecastle’s rebuild main stand is finished. Coming up on the fixture list are trips to Partick Thistle, Dundee and Ross County - venues where resilience and grit are a prerequisite for success. Smith is glad to see stability behind the scenes to allow players to focus on on-field matters. “That’s important, without a doubt. We’ve got a bit of stability now with the manager in place and the transfer window closed. There’s no speculation about any players or anything like that. It’s up to us now to go on a run,” he explained. He predicted more of the scrapping and scratching Hearts produced at the weekend. “I think most away games will be like that, but that’s what you need to deal with to get three points in this league,” said Smith. “On Saturday, we definitely showed we can do that. We weren’t at our best on the ball but I’m not going to blame the pitch or anything like that. We battled through it and got a 2-1 win.